When socializing, good food and drink keep people happy. Those who host large events know the benefits of hors d’oeuvres. Hors d’oeuvres, or small appetizers, allow for the provision of a range of delectable items served on small plates or napkins, without the need for cutlery. A range of finger food recipes that require minimal time in the kitchen will enable hosts with large guest lists to avoid complex menus. Nothing but a wooden stick with a pointed end, skewers enable seemingly unlimited combinations of foods. For something savory and warm, pick from a variety of grilled kebab recipes. 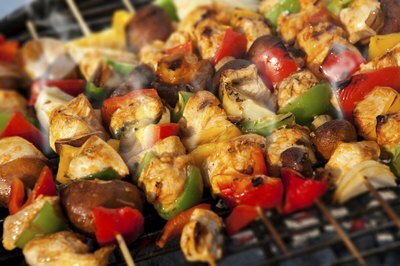 Choose kebabs especially for outdoor events where cooks will work on barbecues. Kebabs originate in the Middle East and traditionally use marinated beef, lamb or chicken. On the skewers, combine meats with vegetables such onions, red peppers and cherry tomatoes. For something on the sweeter side, skewer chunks of various fruits like pineapple and melon. The wide assortment of types make sandwiches suitable for everything from a Super Bowl gathering to an English tea party. For a formal event, try cucumber and cream cheese, goat cheese and watercress or smoked salmon on pumpernickel. 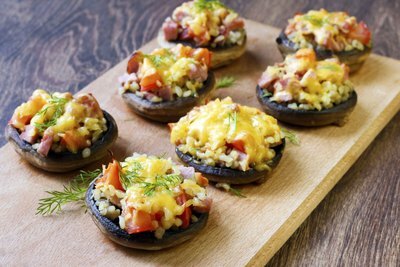 At a casual event, serve egg salad, ham and swiss, tuna or bacon and cheddar. Cut each whole sandwich diagonally twice to create four servings. Secure each wedge with a decorative toothpick and stack them on platters for serving. Turn small, whole fruits and vegetables into appetizers by taking out their centers, creating fillings, and stuffing the filings into the cored cavities. Bite-size mushrooms are a fitting choice. Possible fillings include cheese, sausage or crab, typically combined with herbs and other ingredients such as garlic, onion, black pepper, parsley, bread crumbs and egg. Other possibilities include stuffed cherry peppers or stuffed cherry tomatoes. For dessert, try strawberries stuffed with flavored cream cheese, mousse, cheesecake filling or marshmallow cream blended with cream cheese and almond extract. 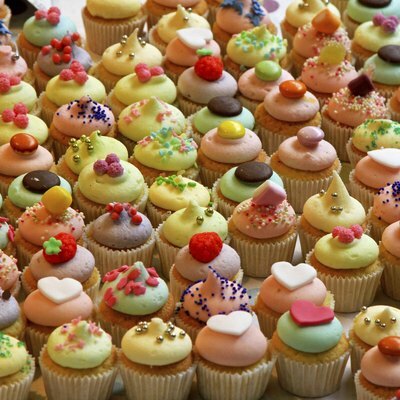 For bite size desserts, mini cupcake trays allow bakers to pump out a large number of pastries in a small amount of time. Choose a simple cupcake recipe that has minimal ingredients and use an icing bag to pipe topping more quickly than knife-spreading each cupcake. Easy cupcake recipes include yellow cake or chocolate cupcakes with chocolate frosting, or vanilla cupcakes with vanilla frosting. For something a bit more exotic, add coconut, cherries, cream cheese, nuts or spices. On special occasions, dye frosting to fit, such as pastel-colored for Easter or orange for Halloween. Sprinkles on top also allow for quick decorating.